I happen to be something of a Hawkeye fan actually. He has an unusual skill where others have superpowers (which does make it just a tad ridiculous for him to be fighting next to people like Thor, even though Clint’s bow and arrows do make for a more versatile weapon than Cap’s shield), and he’s got a rather charming bad boy personality. In his most recent mini-series Hawkeye: Blindspot, which debuted last week – following on the heels of Hawkeye & Mockingbird, and the mini Widowmaker, co-starring the Black Widow – we also see Clint begin to develop a certain condition in common with our very own Matt Murdock. Now, this whole storyline begs for further scrutiny (which I’ll get to below), but the reason for my even including it here is the rather obvious Daredevil joke one might expect in an established-superhero-goes-blind type of story. While this issue, by Jim McCann and Paco Diaz, really wasn’t half-bad, it does bring us back to the discussion some of us had in the comment section to my recent post “Oh, the blind thing? It comes and goes…” regarding which conditions are and are not treatable in a fictional universe of advanced science and magic. Clint’s obviously got a subdural hematoma (as it’s explained to the reader). These should be easy to fix with normal medicine. They do it on those medical TV dramas all the time. 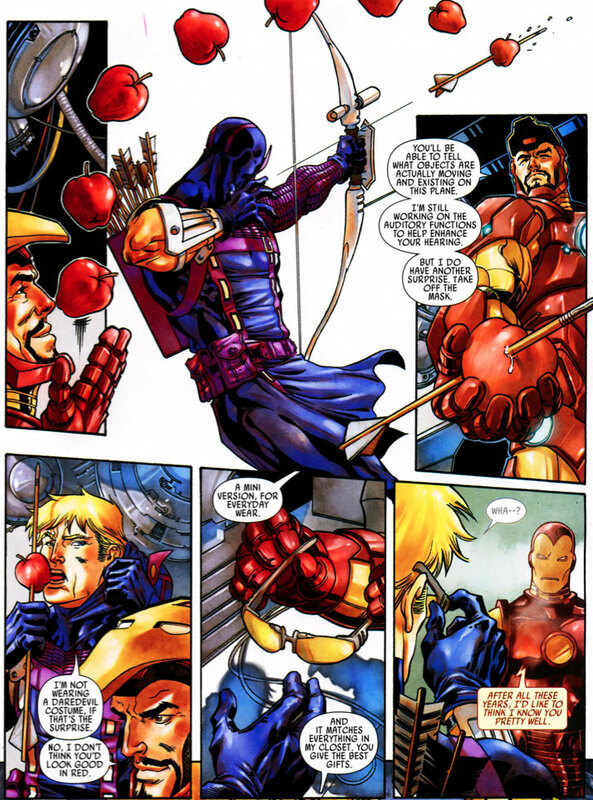 To nitpick further, Tony Stark gives Clint some gear that supposedly feeds right into his occipital lobe and stabilizes the visual input. At least I think that’s what it does, the whole thing is a little fuzzy. If this somehow bypasses the damaged area, then fine. If it simply substitutes normal visual input with something else then, well eh… no. You see, many of the areas of the brain that we think of as linked to a particular sense are actually more task-oriented than restricted to a particular input channel so you can’t actually cheat it with something that behaves like vision, but isn’t. Anyway, it’s a long story and I won’t bore you by going into the details. Suffice it to say that Hawkeye: Blindspot #1, for all its wit and deeper moments also sports quite a bit of comic book magic. Before I go, I also wanted to let you know that I’m working on an extensive “Daredevil for beginners” guide and, as part of this initiative, I’ve updated my old post called “Daredevil Volume 2 for Dummies” to include all available Volume 2 TPBs and HCs as of February 2011. So, if you think you might have missed something, you know where to turn. Hawkeye happens to be my favorite comic book character. I love the fact that he has carved out a niche for himself, even whilst fighting alongside allies that are far superior to him when it comes to powers/abilities. His attitude ranges from admirable to petulant. He’s a “damn the man” kind of superhero, and I dig that about him. He’s nothing like me. He’s everything that I am not, and that is why I gravitate toward him.